K: Hello, everyone! My name is Kamelia and I finished my first year as an undergraduate student in Biotechnology. Living in the UK has been a dream of mine ever since I started studying English. The numerous travels for maths competitions (yes, I am good at Maths) and international camps further influenced my decision to study abroad, in English institution. Following my dreams, I found myself studying at the University of Surrey. N: Hello! 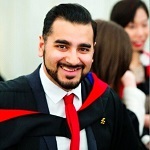 My name is Niraj, I finished my master degree in Surrey in September last year and I still live in Guildford. 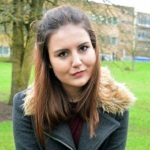 After I finished my studies, I stayed in Guildford because I enjoyed my experience at the University of Surrey and I decided to stay around and find out about possible ways to get involved with the University. How did you get your role as a Student Ambassador at the University of Surrey? K: I was quite excited about the university and was reluctant to miss out on any event! I attended all the social events, kept myself informed about the latest news and scientific seminars and participated in workshops and projects. When I had my first campus tour by a Student Ambassador, I knew that this was the perfect role for me! N: After I handed in my dissertation back in September, I took a month off to travel and visit family. Once I returned, I found a full time sales role in Central London. I decided to stay in Guildford and commute to London every day. Although such an opportunity provided me with invaluable life experience, I decided to find something else closer to home. Why engage with the University? K: Although I devoted myself entirely to my studies, I wanted to be independent and be able to support myself financially. Engaging with the university was the first idea which came to my mind when I started looking for part-time jobs. This opportunity offers flexible working hours, a safe environment, the perfect location, valuable experience and contact with a diverse range of people. It seemed like the perfect plan to me! N: After looking for other opportunities in London, I decided to apply for part time roles at the University while I kept looking for graduate schemes. I temped as an events assistant to work with the Executive Lead Policy managing the National Student Survey campaign. It became one of my best experiences at Surrey, even after finishing my student life. What opportunities are available to students who want to work at the University? K: During Freshers’ week, we had welcome talks, inductions and, of course, ambassadors introducing their job, the application process and deadlines. Fortunately, I was hired for the student ambassador position and my journey began. Ever since then, I’m guilty of invading nearly all of the University departments! I got promoted to Senior Student Ambassador and I found the Careers Ambassador opportunity on Unitemps. 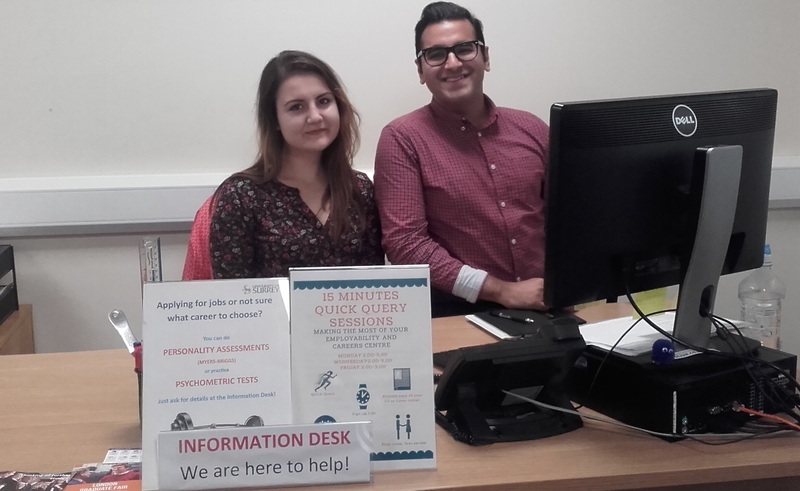 I also gained further insight into graduate and placement opportunities at the Summer Careers Fair, as well as all the other valuable support the Employability & Careers Centre provides. N: Surrey has plenty of opportunities to get your career started. Whether you are in your first, second or last year in your course, there are always great opportunities available that will be a huge benefit to your CV by the time you graduate. There are great opportunities to gain experience and boost your CV by working on campus on a part time basis. After having worked in different departments on campus, I saw an opening to become a Student Careers Ambassadors. Always do something you like! Be honest to yourself and once you have found something you enjoy doing, demonstrating your enthusiasm to others will be a piece of cake! Do your best and do not give up – it’s better to try and fail than never try and ask yourself ‘what if’? Every step you take is a valuable experience. You are a student and this is your time to follow your dreams. Go, explore and be curious! Do not waste time – take advantage of all the possibilities that Surrey provides! After applying for roles that you might really like and did not received a positive answer, don’t ever let these answers turn you down. There are hundreds of opportunities that become available around the UK each day. While you wait for the right job, try to get as much experience as you can, either full/part time roles or volunteering. It will all be a plus by the time you graduate!